Bovis Homes were delighted to host the local MP at their regional Coleshill offices recently. 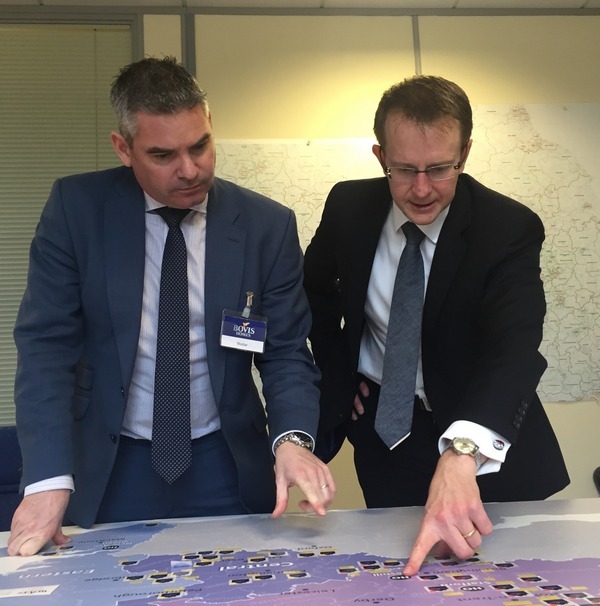 North Warwickshire and Bedworth MP, Craig Tracey, visited the Midlands headquarters of one of the area's major employers to meet staff and discuss housing issues with senior directors at the company. Chief Operating Officer Keith Carnegie provided an insight into the work that Bovis Homes does at both local and national level, including details about their apprenticeship scheme and a programme to employ ex-military personnel. They discussed how to address the skills challenges within the housing industry and the opportunities to help meet the Government's target of building 200,000 houses a year. "We had a wide-ranging discussion, looking particularly at the importance of our work in attracting new people into housebuilding," said Keith. "Mr Tracey was supportive of our efforts in this regard and we are grateful for his interest in Bovis Homes and our staff, many of whom live in the North Warwickshire constituency." The Coleshill offices are the regional headquarters for Bovis Homes, with around 200 people based there, supporting the locations where the company are building across the Midlands. Bovis Homes was successful in building 3,934 homes in 2015, setting a record for the business and an increase of 8% on those built in 2014 (3,635). The North Warwickshire MP, a supporter of the charity Care after Combat, registered his backing for Bovis Homes' Trainee Assistant Site Manager Development programme, which has been successfully completed by a number of ex-military personnel, providing them with a gateway into the industry. Mr Tracey said: "It was useful to meet with Bovis Homes to understand the work they do. They build high quality homes and we know there is a need for more housing in suitable areas. I was particularly pleased to see their approach to apprenticeships and the support they are offering to those who have served in our armed forces. The benefits of apprenticeships for young people and local businesses cannot be underestimated. I look forward to working with Bovis Homes on these areas moving forward."